Tycho will be releasing a new album entitled Awake on March 18th via Ghostly International. We’ve already heard the title and lead track from the record now we have a new single “Montana”. The song isn’t a stretch for Hansen’s project carrying the same ambient glow as his previous releases, but it has tinges of indie guitar pop in the vein of Real Estate that much of his work doesn’t. Overall it’s an extremely enjoyable track increasing our anticipation for the full length. Pre-order Awake HERE. Keep Shelly in Athens released this track in homage of the departure of longstanding collaborator and singer, Sarah P. She’s leaving is order to focus on her other projects. Sarah and RΠЯ have worked together as a duo since 2010 so it will be interesting to hear future recordings sans Sarah P. A new KSiA album is to be announced later this year. Two of our favorite producer outfits Treasure Fingers and The Knocks teamed up for this smooth little number asking “Do You Want To?” The answer is yes guys, whatever it is, we’re in. The track is up for free download on SoundCloud HERE. LA synthpop duo Carousel are back with what may be their best work yet, which is saying something about the up and comers who have been dominating Hypem and other music blogs for the past year. Lyrically the guys stay on common ground, driving off “Into the Night” with a new fling, but musically they have really tightened to basically hit nothing but that nostalgic sweet spot for 4 minutes. Great music for your hump day. 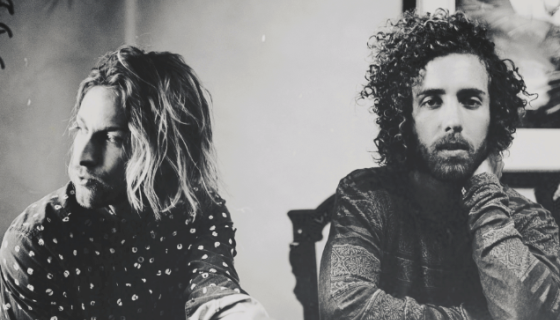 Fresh off the release of their great debut album Psychic, Darkside (the duo of producer Nicolas Jaar and guitarist Dave Harrington) have announced a tour for 2014. Check out the dates below. One of the highlights of the album is the slow burning guitar driven Paper Trails, featuring ethereal vocals from Jaar. The guitar lines definitely call back to Pink Floyd guitarist David Gilmore and make the point that Darkside probably got their name from the Floyd’s classic album.